We call it the Big Bang, the Primordial Wham! Scientists say it’s how the universe got started. The event is described as a sound. Modern physics is not the first to identify sound as the primordial energy that operates the universe. Ancient Vedic texts describe sound as the energy that runs through all life, the essence of creation. The original tone is “om,” what Hindu tradition calls the sound of God. The Bible also opens with a sonic beginning. “In the beginning was the Word. And the Word was God,” it says. That word was a sound, of course. Other creation myths are similar. Mayan lore says the original sounds were so powerful they could split rock, suggesting that was how temples like Machu Pichu and Uxmal were built. Egyptian myth includes the god Thot, said to have created the world with the power of his voice alone. Many primal languages, including Kung and Dogon of Africa, use the same word for “sound” and “creator.” Hopi Indian tradition describes Spider Woman, who created the world by singing over it. From “Big Bang” to “Spider Woman,” sonic energy is primal. That energy persists and an holistic view of the universe would concede that we are elements of sound. From this understanding comes the idea of using sound to coalesce a state of wholeness and reestablish the stable patterns in the body that support health. One application of sound in healing is described in the ancient Vedic practice known as Gandharva veda1. (Heartland Healing YouTube video here.) It is music used for health since early in Indian history. Performances, musically called “ragas”, emulate the diurnal cycle of energy. Each part of the day has its natural energy and all things in this world ebb and flow with it. In the morning, for example, there are the lifting energies of the rising sun, the awakening activity of animals and plants. Evening energy is slower, relaxing and transitional. Daily cycles flow on a wave of energy. Bodily cycles are also on that wave. Nature’s Way. Sound also makes patterns in nature. Studied thoroughly by Swiss researcher Hans Jenny and German scientist Ernst Chladni. each found that sound organizes matter in near-perfect patterns of symmetry. Using tones and rhythms, they studied how molecules of powders, liquids and solids are organized out of chaos into patterns. Place a pile of metal filings on a drum head and play a pure tone near it and you will see the filings vibrate and organize themselves in organic shapes and designs. Those patterns vary based on the amplitude and pitch of the note. 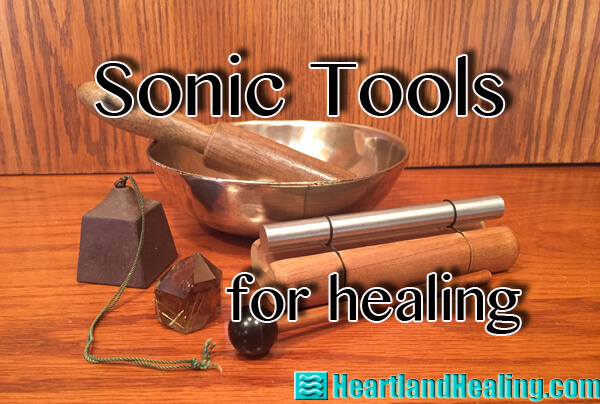 Sound has been used for healing in many ways, from Rife’s machine to crystal bowls struck to resonate with the energy of the body. Perhaps the most organic and natural way to use sound for healing is to create the sound with the very instrument that it is trying to heal. That instrument is the body and the sound created is the human voice. Healing Sounds. The human voice and sound have a unique relationship. Sound is ordinarily defined by any sonic energy that can be detected by the ear. Of course sound is more than that. Just because humans don’t hear it, does not mean a sound doesn’t exist. Though sound exists in frequencies below and above what we can hear, as in the case of a dog whistle, the sound that we can detect with our own ears has a special effect on us. Humans are most responsive to the sound of the human voice. In 1935, American researchers Harvey Fletcher and W.A. Munson of Bell Labs established research that has been called the most significant in human hearing. They measured the frequency response of the human ear. What they found was that the human ear responds best to midrange sound, those frequencies from about 300 cycles per second (called Hertz) to about 3000 Hertz (abbreviated Hz.). Not so coincidentally, the range of the human voice is right in those frequencies. Yes, it is common sense that the human ears evolved to respond best to the human voice. See how we struggle to “prove” something that ancient cultures just took for granted and used appropriately? Tuning with Tones. Using our voice to relate to our body is only natural. When we stretch, we often make a groaning sound to accompany it. When we sigh, it’s a sound. When we feel pain, we moan or cry out. As babies we make soothing sounds as we lie in our cribs and respond to the soft sounds our mothers use to quiet us. Chanting is a specialized version of toning that uses words. The sound of the words are more important than the meaning of them. All major religions have used chanting as a way to express and bring peace and harmony. There are more specific ways to target the body for healing. When we organize sound into vowels and voice them, we are combining breathing and sonic energy into a force that regulates, stabilizes and reorganizes our body, just as those metal filings are organized when we play a tone through the drum head they rest on. Aside from learning what the special sounds are, there is another, simpler way to learn about toning. One of the most important and useful sounds to us is the sound of our name. We are deeply connected to it in many emotional ways. For a general way to use toning, think of the primary vowel sound in your name. Begin by humming that quietly to yourself, breathing easily and regularly. The sound may change a little in pitch or intensity as you do it. Just let it find its own variation. Keep it up for a few minutes until you can feel the resonance through your body. You may find a feeling of comfort or relaxation and well-being. Eventually when you practice, you can open the mouth and begin to tone out loud. Try it and you may find your voice.